You know those meals that are never pretty, but they are always tasty? The meals that your family requests and you cringe because you never really can get excited about a “casserole” for dinner? This is one of them. 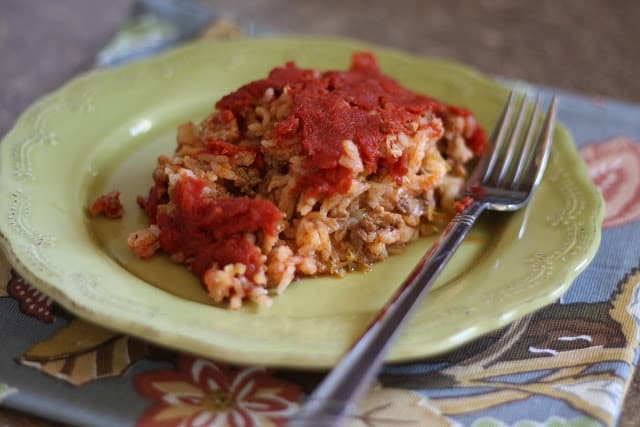 Cabbage Rolls are one of my husband’s favorite foods. This version simplifies the traditional rolled version down to just a couple of steps and despite appearances, they really are tasty! 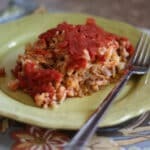 I’ve been making this version of cabbage rolls for years. This is a very quick meal to put together and then it cooks in the oven through the busiest part of the the day. I usually prep two smaller pans and freeze one to cook another day. Thaw completely prior to placing the frozen one in the oven and then bake as directed below. Preheat the oven to 350 degrees. Spread the cabbage across the bottom of a 9x13 dish (two smaller pans will work as well). In a large skillet, over medium heat, cook the ground beef along with the onion. Drain any grease from the pan and add the rice and all spices to the skillet with the meat, stir to combine. Spread the rice and meat mixture over the cabbage in the baking dish. Mix together the tomatoes, sugar and vinegar and then pour over the meat and cabbage. Cover with foil and then bake for 90 minutes. Uncover and let rest for 5-10 minutes prior to serving. Enjoy! of the freezer and place it in the fridge. Once thawed, bake as noted above. i am cooking this now and my whole house smells delish.. can't wait to try it!